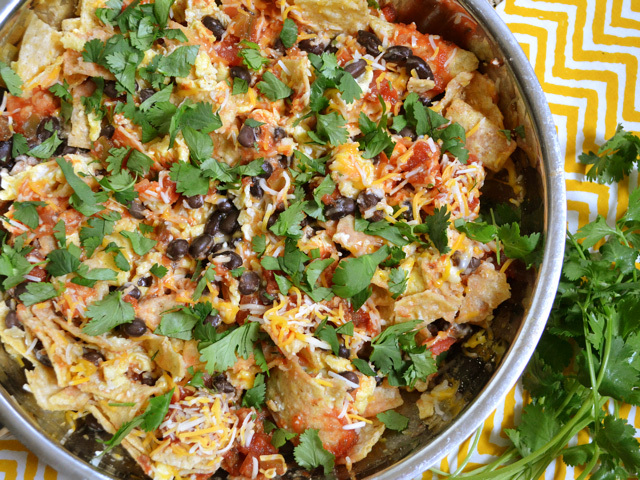 Ahhh, it’s everything I love in one place: eggs, salsa, cheese, chips, and cilantro. Oh, and black beans, too! Just feed me this every day for the rest of my life and I’ll be straight. 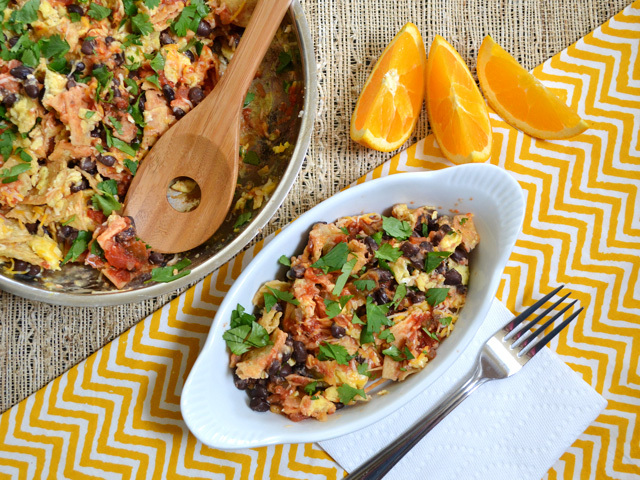 This super quick Southwest Breakfast Scramble is reminiscent of migas because of the tortilla strips, but I just ended up adding all the things that I like best. It’s really delicious and hearty… and who really cares if you eat it for breakfast, lunch, or dinner? I know I’ll be bringing it to work with me tomorrow for lunch. I’ll be using the microwave to reheat my leftovers. Sure, it will change the texture a bit (the eggs will get more firm and the tortilla strips more soft), but that’s just how leftovers go. It’s never quite the same, but still delicious! P.S. If you’re not into cilantro, use some sliced green onion instead. They don’t taste similar at all, but it’s nice to have something green and fresh on top for contrast. 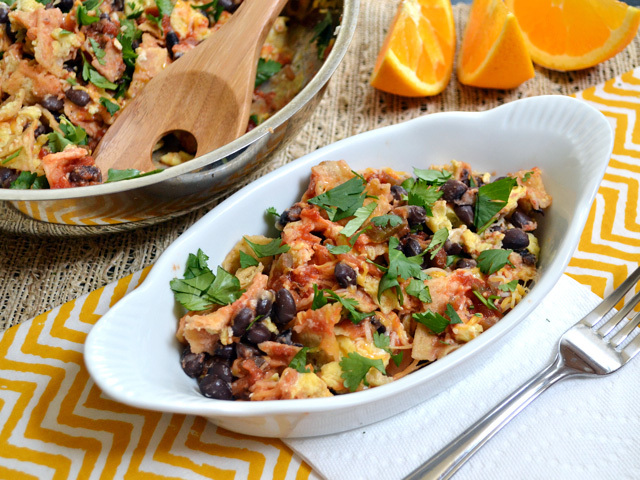 Eggs, tortilla strips, salsa, beans, cheese, and cilantro create an addictive mix in this Southwest Breakfast Scramble. 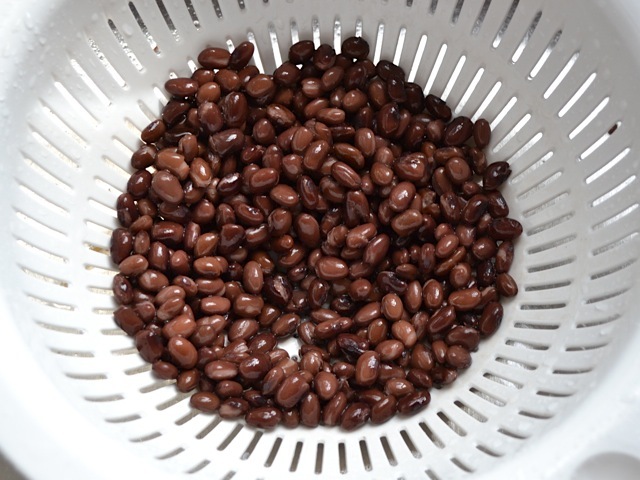 Drain the black beans and rinse them briefly with water. Let them drain while you prepare the rest. 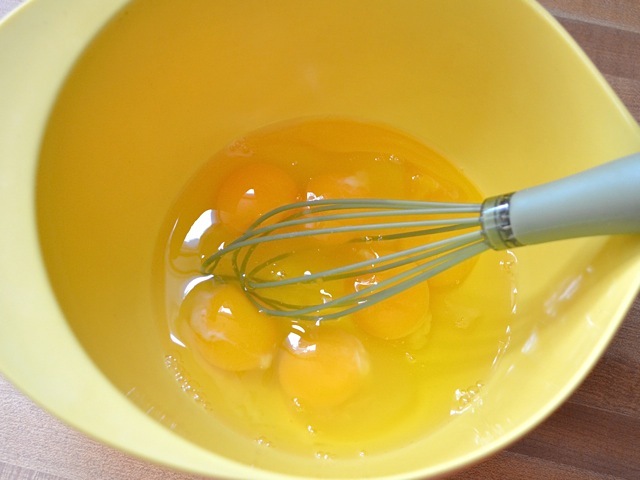 Crack six eggs into a large bowl and lightly whisk them. Melt 2 tablespoons of butter in a large skillet over medium-low heat. 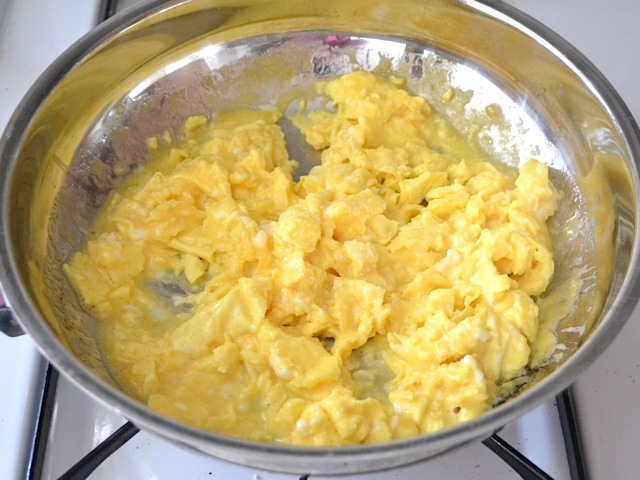 Once the butter is melted, pour the eggs into the skillet. Let them cook slowly over medium-low heat. 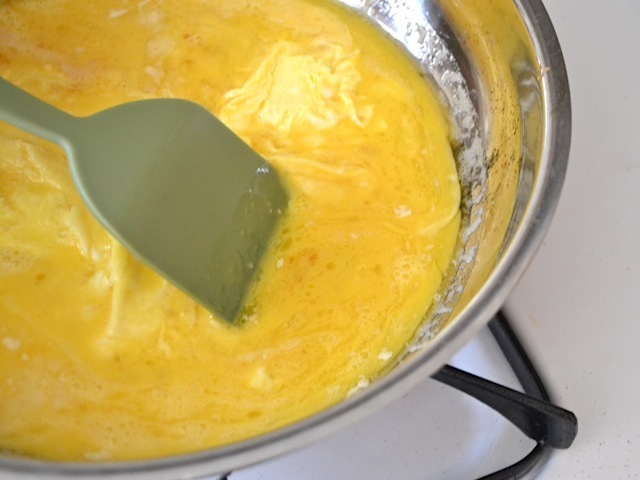 As the bottom layer begins to set, use a spatula to drag the outside edges in towards the center, allowing the uncooked egg to run back into the empty space. Continue to gently move the eggs around in the skillet in this manner until they are about 75% set. The eggs will continue to cook as you add other ingredients, so you do not want to over cook them at this step. Season the eggs with salt and pepper if desired. 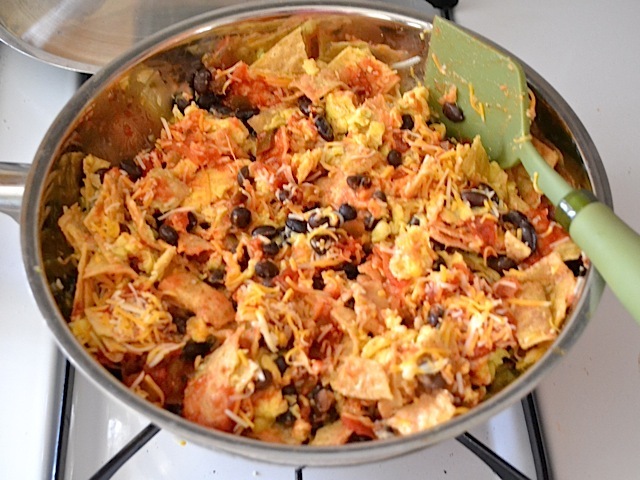 Add the drained beans and 2-3 cups of tortilla strips to the skillet. Gently fold them into the eggs, breaking the tortilla strips into smaller pieces as you go. 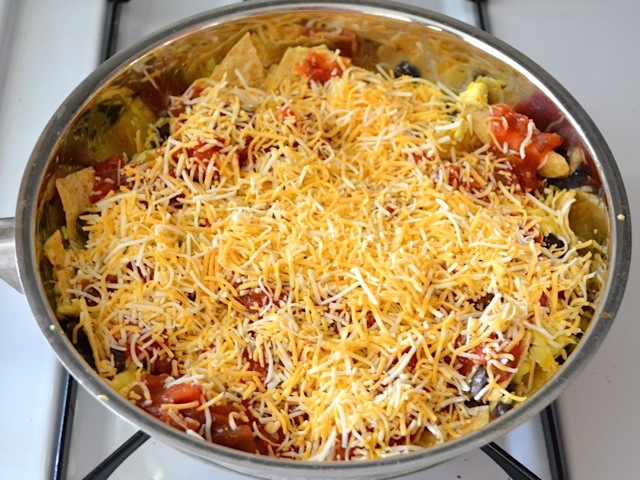 Spoon one cup of salsa over top of the egg mixture and then sprinkle one cup of shredded cheese over top. Place a lid on the skillet and turn the heat up to medium. Allow the skillet to heat for five minutes, or until mostly heated through. While the skillet is heating, pull the cilantro leaves from the stems and give them a rough chop. Remove the lid and gently fold the ingredients in the skillet, so that the cheese gets a little mixed in and melts slightly. Sprinkle the cilantro over top and serve hot. Rinse the beans first, so that they’re ready to go when you need them. The cooking process is quick and if you get delayed the eggs may become over cooked. Melt two tablespoons of butter in a large skillet over medium-low heat. Once melted, pour in the eggs. Cook the eggs slowly over medium-low heat, gently moving them around the pan only when the bottom layer begins to set. Never briskly stir the eggs while they cook because this will create small, dry pieces rather than large, moist folds of egg. Only cook the eggs until they are about 75% set. They should still be moist, but in large pieces. They will continue to cook as you add the rest of the ingredients. 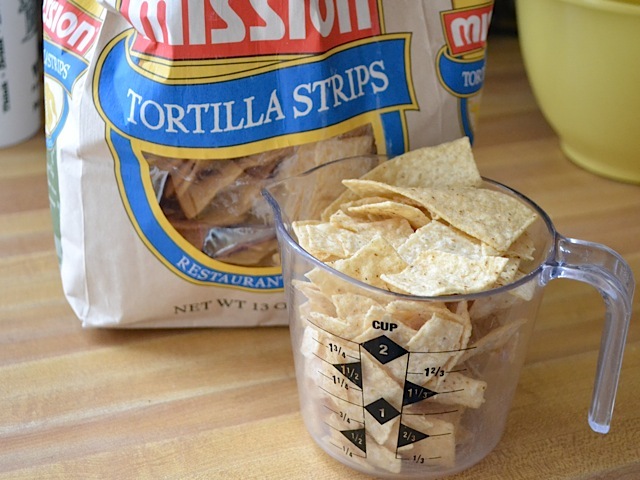 I like these Mission tortilla strips for this recipe because they’re thick and can hold up to the moisture in the scramble. Plus, they’re usually a bit less expensive than regular tortilla chips. I used somewhere between 2-3 cups. They’re kind of hard to measure. 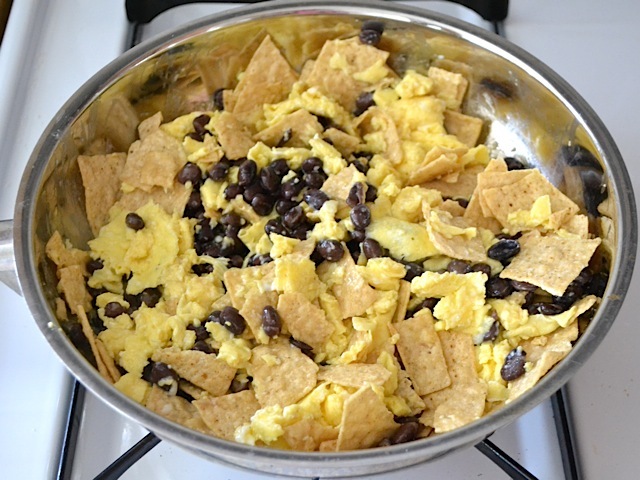 Add the beans and tortilla strips to the egg, and gently fold them in. Break up the tortilla strips into smaller pieces as you fold. Spoon the salsa over top and then cover with cheese. 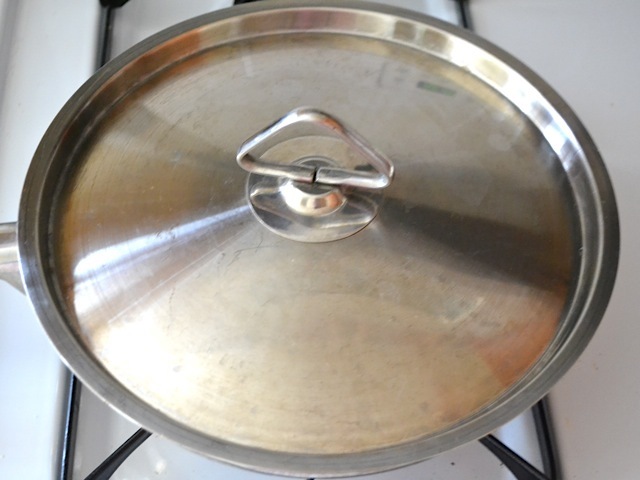 Place a lid on the skillet to hold in the heat, turn the heat up to medium, and let it cook for five minutes, or until it is mostly heated through. After it heats, gently fold the mixture a little bit more to incorporate the cheese and let it get in contact with some hot parts, so that it will melt. Sorry, this picture has a bad case of the blurs. Top with fresh cilantro or green onion, if you prefer! Eat! I only post this because this site about eating on a budget, but cilantro stems are perfectly fine to eat; they taste the same as the leaves. I wouldn’t use *all* stems for textural reasons, but definitely don’t just throw them out like you would parsley stems! I find that they have even more flavour. I usually use them in the recipe and then the leaves for garnish. Keep in mind our company has just gone “paperless”. I had hoped with this new app I could quit getting in trouble for printing out my recipes. Looks like I will keep getting reprimanded instead. Please add this for us Android users!! I really like my job and want to keep it but I also want to keep using Budget bytes!!! 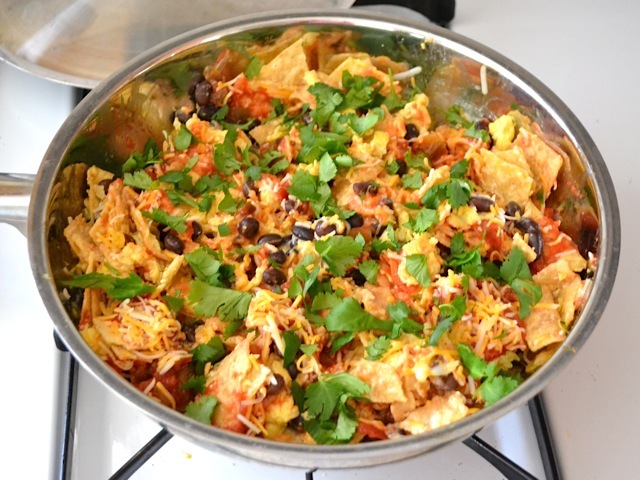 ….. Now my boss is rubbing it in…… Bragging on the images and ease of finding recipes. Now she’s telling me about the COLLECTION SECTION!!!!! Please help me!!!!!!!!!! I really hope we can develop the Android version soon! 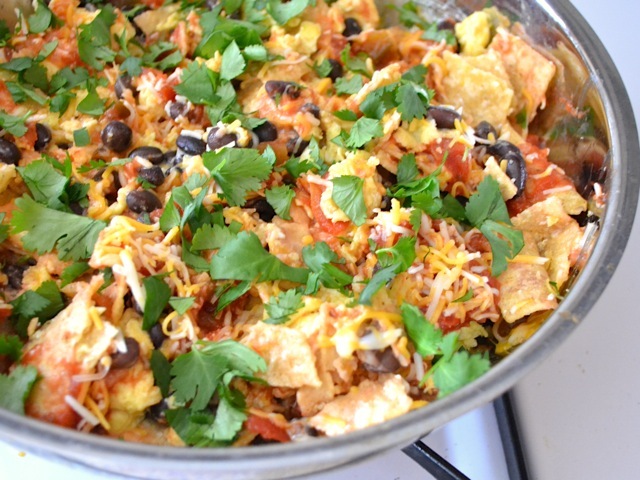 This recipe is so simple and easy and tastes amazing! We cut it in half (only because we were low on eggs) and substituted green onions for cilantro (it’s all we had)- it was plenty for two people. It was light enough that we didn’t start out our day too heavy but still filling. This will be on repeat in our kitchen this year! 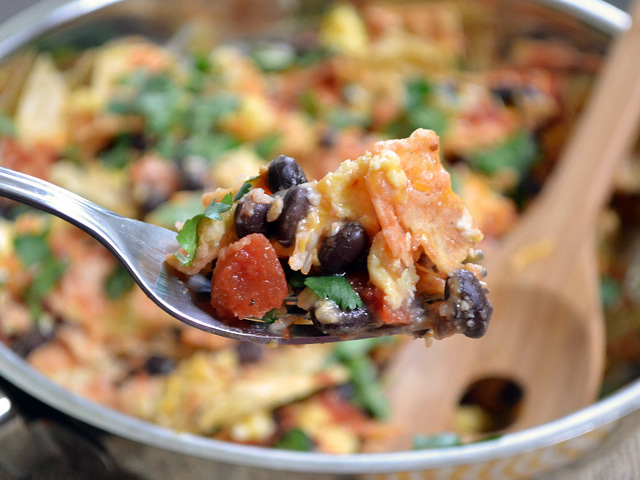 This sounds fabulous as a filling for breakfast burritos (minus the chips). Will be making tomorrow with a little crumbled sausage in it. Beth, I just discovered your site through recipes posted on Imgur. So far I have made about three of your dishes and I’m pretty sure we should get married. Get in line man. If she’s going to marry an Imgurian it’ll be me, her sriracha soul mate. Im looking to try something new. Im pregnant and am getting tired of cooking the same dishes over and over and over again. I plan on making this as a dinner dish instead of breakfast, kinda like breakfast for dinner.. Well anyways, i am wondering and just want to make sure, were the beans precooked in the can? Ive made beans before with my rice but separate pots and have had to boil with other ingredients and water so they can become soft… Leaving them for 5 minutes with the eggs will cook them to be soft? I think I’m over thinking this lol. PLEASE help i don’t want to mess this recipe up since I’m looking sooooo forward to making a new dish! Sorry it took me so long to respond – I was on vacation. :) Yes, the beans are pre-cooked canned beans. Five minutes would definitely not be enough for dry beans. I hope you enjoy it! I didn’t have any salsa this morning so I substituted a can of diced tomatoes for it. I drained quite a bit of the liquid by holding the lid in as I poured it out. I was afraid there was going to be a huge loss of flavor, but while it did taste different than the original recipe it was still extremely tasty, and the consistency was still perfect! I was wondering what the calories or fat intake is on this receipe? ?